Thanks to our partner Traveling Mom and to Anuja De Silva Cosmopolitan with Kids for the amazing guest article on travel tips! Lack of time to plan travel is common complaint among working parents. 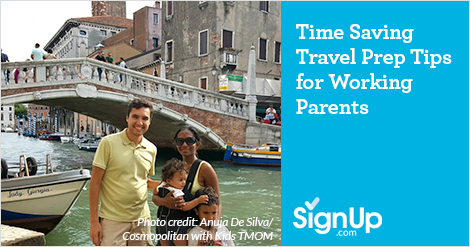 As a mom of two who works outside the home full time, I have some tried and tested trips to help working parents carve out time to plan travel. Don’t stress about catching every deal. Doing the planning in stages can help your travel dreams come to life. Keeping the house ready and prepping ahead for your arrival can help you jump right back into your routine after a memorable trip. Planning travel while working full time is a challenge. I’m the mom of two under the age of five and I also work full time, so I have experienced the struggle first hand. In order to continue traveling, we have to be creative in how we integrate planning to our packed schedules. Embracing different cultures and trying to raise our kids as global citizens means making the extra effort to show them the world around us Here are a few travel planning tips that have made our lives a little bit easier. There will be some trips that we plan ahead of time (spring break, summer etc.). We just go ahead and book the trip as early as possible. Booking at least 6-8 months in advance can certainly save you money compared to the typical 2-3 month booking that we’re accustomed to. For working parents with limited vacation, timing is crucial. Hopping on a plane at a couple of weeks’ notice because it’s a last minute bargain just isn’t doable. But if you can, book travel and hotel ahead of time. It is a huge time saving step when your work schedule gets hectic and travel day draws closer. Determined to take advantage of travel deals, I signed up for at least five different sites last year. But in the end, I didn’t take advantage of any of them. The deals flooded my inboxes daily and my plan of sorting them during the weekend quickly went out the window. Take time to read through the online sites to determine which works best for you. There are plenty – Airfarewatchdog, The Flight Deal, Travelzoo etc. I recommend signing up for one or two with narrowed down searches so you the deals you receive are relevant. Recently we had luck finding good comparative rates on Momondo for flight deals. I also consider booking flight+ hotel deals to help save time and money. Whether it’s a note on your phone, physical list on your planner or a Pinterest board, it helps to collect ideas for day trips. There are plenty of things to see in 50-100 mile radius from most homes. This will make you feel less overwhelmed when you have time for an impromptu getaway. I add to my list when I hear of trips my friends have taken or see things that interest me on social media. My husband and I have come up with our own system for divvying up plans. Depending on our interests one of us will be designated to book flights and hotels while the other plans activities. Having this decided ahead of time means you both won’t spend your time on the same task. We have a shared google doc where we list our findings to keep track of what each is doing. As a seasoned traveler, I cannot emphasize how important this is. I really believe in a physical list compared to the mental one I used to feel was sufficient. I didn’t always – but that was before I forgot our car seats on a recent trip! Having not needed to bring our car seats on two previous trips, we completely forgot about them. An app or a list would have definitely saved us. Packing for a family of four for our ten day trip to Italy was an overwhelming task until I discovered packing cubes. They are lightweight cases that can be used to pack items in groups. Since then, we have use them on both long and short trips. I pack the whole family’s outfits grouped by either day or destination in one cube. Then I pack separate cubes for toiletries and items that we will need on a daily basis. This method prevents us from over packing. It also keeps track of items during the trip. No more stress on what to wear on which day, and our outfits are coordinated when taking any special group photos. I pack the used clothes in plastic bags and put them back in the packing cubes for our return trip. As working parents, we always arrive to a full day at work upon our return. So we try to keep the house organized for our return schedule. That meant keeping our son’s school clothes ready and having some packaged foods ready to go for breakfast and lunch. We also shop for some frozen or prepackaged meals that can be prepared fast and easy. If you have a grocery delivery available, I recommend placing an order for basics such as bread and milk that can get delivered or picked up on the way home. Whether it’s checking to make sure that your security system is up to date or letting a neighbor know your plans, make home security a priority at least a week before the trip. Save the link to the US postal website so you can place a request to hold your mail within a couple of minutes. Unpacking and laundry are two of the most abhorred tasks for any traveler. I get them out of the way as soon as I enter the house. Instead of taking the bags up to our rooms and sorting things through, I open them up and empty the packing cubes with used clothes in to the washer straight away. Depending on my energy, I start the laundry at once or the following day. This helps to get back in to the regular frame of mind and get back to our daily routine. Find other great traveling tips and ideas on TravelingMom.com!